Thelma Wilson joins a pretty distinguished Lou-Neita crew that includes the excellent Gina Hill and The Bishop but in no way is she outclassed in this exalted company. 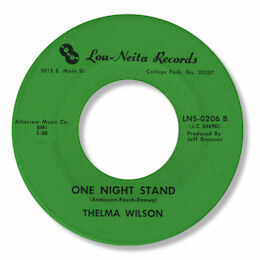 One Night Stand is excellent deep soul with Thelma wailing over a classical southern soul backing. The organ/guitar combination works very well as does the strong horn arrangement. This one should be far better known.